You can also check my Portal. See “Change Log” for the full list. Bug correction in lib custom functions. Added dependency for LAM2, as it now has functions I used to add myself in a local version. Added options for dialog skip for vendors, traders, stable master (BETA). Enhanced appearance when dialog changes. Enhanced fading with the new setting “Extent of the fading effect”. This addon includes many dialog features, to customize it your way and/or to enhance the game experience. From the sizes and styles of each dialog element, to the fading of the text, stopping by to add icons and numbers before the answers. Add the missing space between the end of the sentence (“.”) and the beginning of the next. Get feedback from users Don't hesitate to comment or to ask for a new feature! If you find some other typo corrections to do, please tell me. Feel free to contact me if you'd like to add another language. This addon uses LibAddonMenu-2.0, thank you for this! Also added some other chatter text types that didn't have an affected icon. Added dependency for LAM2, as it now includes functions I used to add myself in a local version. Added "press key to show options" setting. [15:39] NTakDialog: No specific icon found. Please comment the addon on esoui.com and indicate this number: #3800. Got this when talking to a guild trader. It's hard to cover every case, so I added this message just in case. Thanks, great addon by the way! N'Tak' because all my secondary characters names start with a “ N ”. Last edited by NTak : 04/25/19 at 01:07 AM. Last edited by katattax : 04/24/19 at 08:41 AM. For information, I've just added a dependency for LibAddonMenu-2.0. I used to use a local version where I added some custom functions, but I removed it as it's now part of the 2.0 r27 ! What did you do to get this error ? It seems the source of the error is another addon: "TEC" ! Last edited by NTak : 04/09/19 at 09:14 AM. 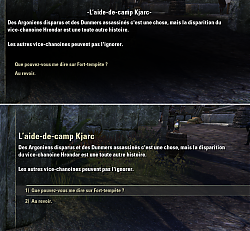 There should be an option for "Don´t fade the text" when speaking to shopkeepers and guild traders and having the option for text fading turned on. Because it´s annoying to have to press the numbers or to wait till the dialog is over. 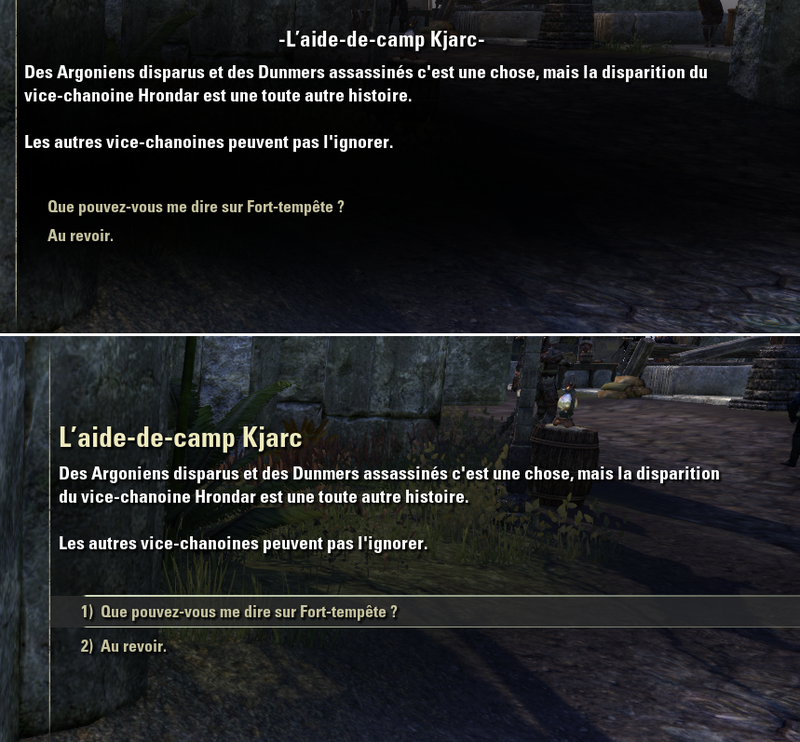 I know, there is an option for to auto-open "stores" when talking to NPCs, but I don´t like it. I like sometemis to talk with them. P.S. or maybe an option to show the dialog while faded in with left mouse button. 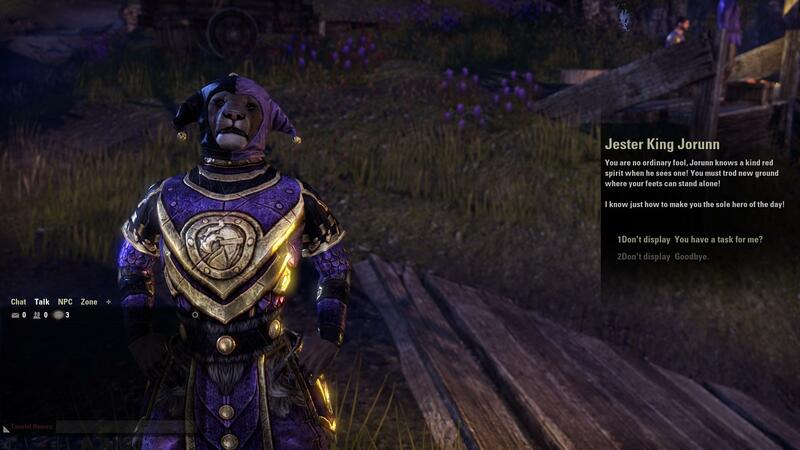 I can tell you : There WILL be an option for "Don´t fade the text" when speaking to … some special NPCs. In fact, the current menus for muting and auto-opening will be merged soon… And I'll add that option in the following updates. Great to read. Looking forward to it. Last edited by NTak : 04/06/19 at 08:59 AM. Last edited by p6kocka : 04/06/19 at 04:33 AM. I've modified a lot the settings with the last update. I suggest you to ensure your "Options" settings are correct, or restore defaults if the problem persists. Have "Don't Display" in front of my dialogue options since the recent update. I have tried the text-fading, but I found it too distracting since the characters appear without fading. Would it be possible to add a feature that hides dialog text and responses until the NPC finishes speaking, something like Immersive Interactions, but lightweight? A chat option that makes the NPC repeat the dialog would be pretty cool as long as the "repeat" chat option is above "goodbye" option. The text-fading uses a fading. You can set the characters delay to its maximum to easily see it. But I agree it can be a little "hard" for the eye. It's a fading per character, not in the text. Anyway, I'm still working on it, and I'll smooth it soon. The problem with "NPC finishes speaking" is that I didn't find an event for that. But I'm working on it. Edit: Fading smoothed in version 1.1, with a new setting to choose the extent of the fading. Last edited by NTak : 03/27/19 at 10:01 AM. Last edited by NTak : 03/25/19 at 12:04 PM. Using this along with slow dialogs + UX dialogue (for the repeat audio feature) makes the dialog text and responses not appear at all. I only use this addon for the the title tweak features, all text tweaks are off, so I am not sure why this addon would cause the text to not appear. I downloaded Version 0.7 and that version works fine, but versions newer than that cause the dialog text and responses to not appear. For now, I admit I did not try at all to avoid any coactivity between other dialogs-modifiers addons. Anyway, as I'm using my own text-fading since 0.6, I think Slow Dialogs isn't needed anymore. Did you try it? Is there something you don't like about my fading? I may add the audio-repeat feature soon. I was also thinking about adding a chat option like "x) Could you repeat? ", if I manage to do it. Last edited by NTak : 03/22/19 at 03:43 AM.